You’ll always find a warm welcome for children and families at the minster, and children will love discovering the stories, weird creatures and amazing carvings. If you are an informal visitor, ask one of our friendly stewards for a torch, pair of binoculars and the latest family friendly trail, or look out for our regular themed family fun days. For tiny children there is a small area with toys – perfect for keeping restless hands busy for half an hour, or during a service. 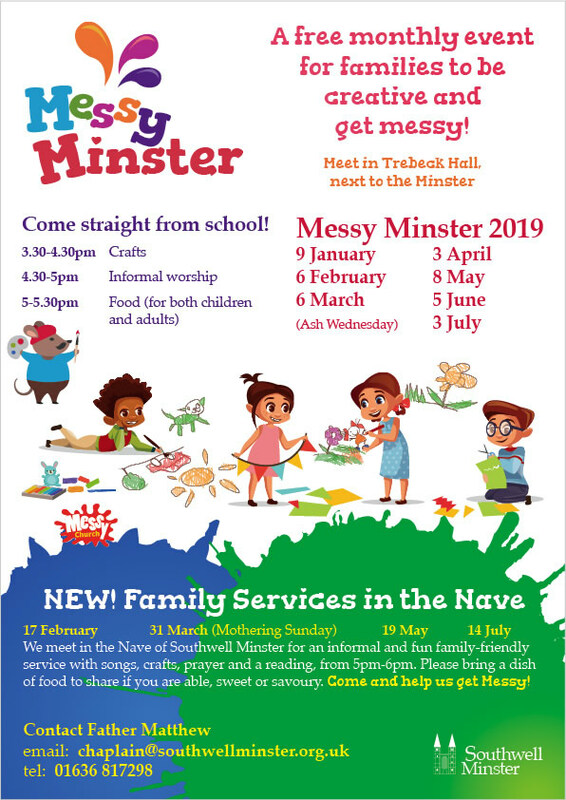 See below for specific sessions or events to suit your needs whether it’s a Sunday club, a fun day out or Messy Minster, we look forward to meeting you – and feel sure that you’ll enjoy exploring the treasures inside. 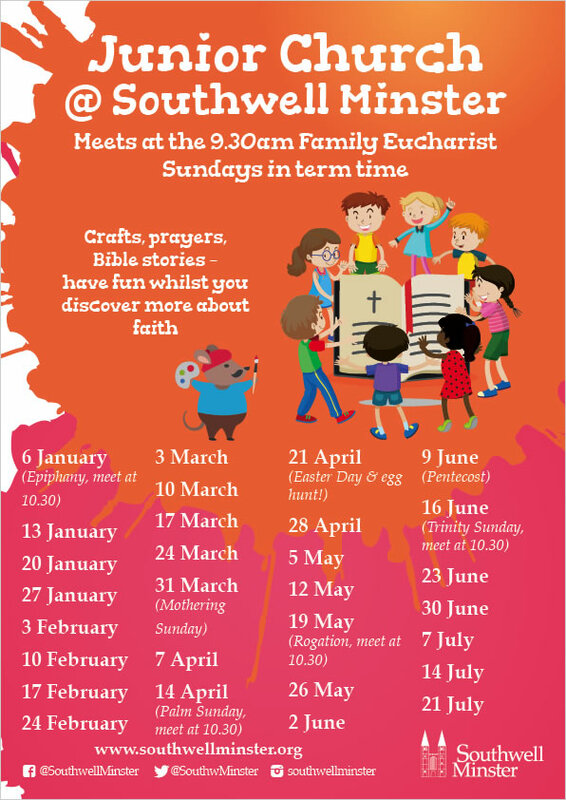 Junior Church, for children aged 3-14, currently meets monthly during the Sunday 9.30 am Parish Eucharist service during term-time. We meet in the Pilgrims’ Chapel from 9.30 am until 10.20 am when we join the service in the Minster for Communion. A free monthly event for families to be creative and get messy! A fun and relaxed group for all the family which meets on the first Wednesday of each month in Trebeck Hall. With informal worship, stories, crafts, food and drink this is a session open to all, no booking necessary. 3.30pm-5.30pm Trebeck Hall, Bishop's Drive, Southwell. Informal family visitors – children and their carers – are always very welcome and we're sure you'll find something to interest you here. If you'd like to come and have a look around together, please pop to the Information Desk and pick up a themed trail booklet for free – our friendly stewards will help you. These booklets change throughout the year, so you can enjoy our seasonal Advent & Christmas or Lent & Easter trails. There is a special summer one for the holidays, and others at different times. To help you find everything, you can borrow a set of binoculars and a torch.